The E&D TAC advises the Regional Transportation Commission and other transportation agencies on the network of specialized transportation services for seniors and people with disabilities in Santa Cruz County as well as about the transportation needs of these members of our community. 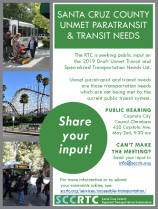 In addition, the E&D TAC serves as the local Social Services Transportation Advisory Council (SSTAC), a state-required entity that seeks input — from transit-dependent and transit disadvantaged persons, including seniors, people with disabilities, low income persons, and youth — regarding transit needs in Santa Cruz County. Meetings are generally held at 1:30 pm on the second Tuesday of even numbered months. All are welcome to attend. Periodically, a committee report is developed to outline the E&D TAC Committee’s accomplishments and goals.